10ft Black double Braided nylon USB Lightning Cable with high speed Charge and Sync Wire. 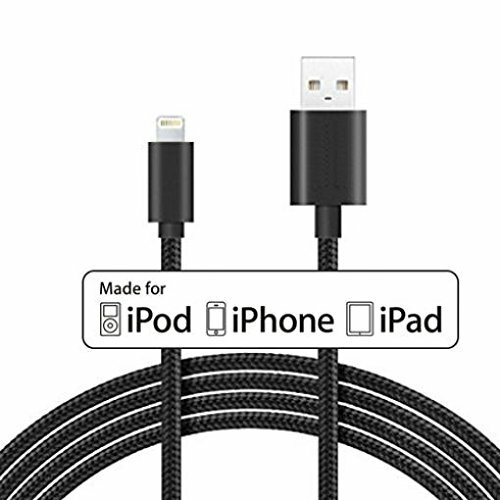 Apple certified, MFi (made for iPhone/iPod/iPad) lightning cable, with authorization chip issued by Apple to ensure 100% compatibility with any Lightning device. 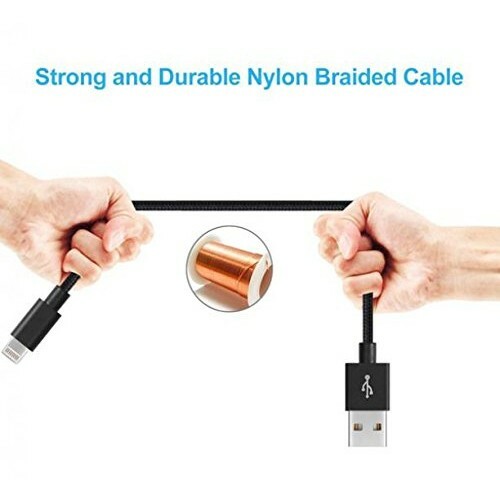 Convenient Length: Measuring at 10 feet, this cable is long enough to charge your lightning devices more conveniently and with more flexibility. Charge and Sync at High Speed: Premium copper wires support signal strength to ensure quick charge and high-speed data delivery. 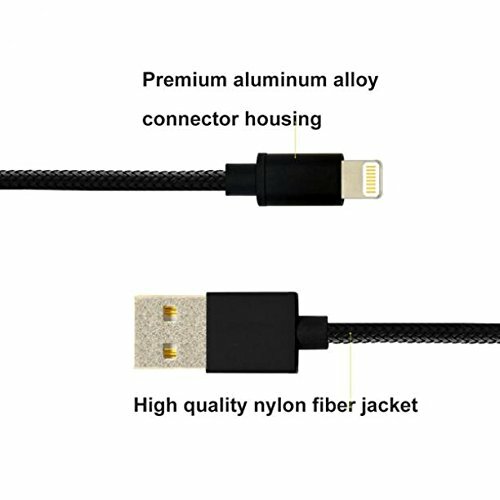 The Braided MFI 10 ft Lightning Cable nylon Jackets are mess free and stress free - anti-tangle materials ensure the cable does not get tangled. 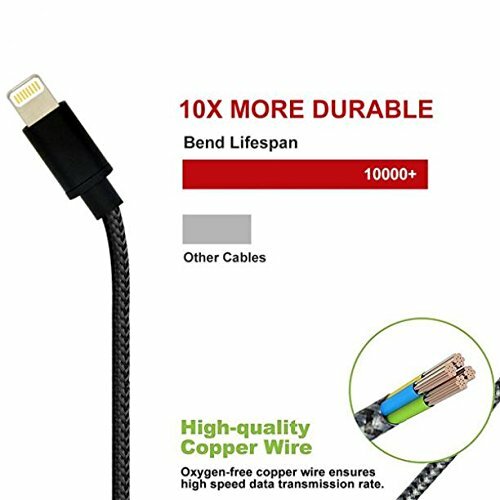 Lasts longer than ordinary cables - withstands over 10,000 bends. Amazing Strength: One of the toughest cables ever created, with tensile strength capable of withstanding over 100 lbs. Apple Certification: MFi certified for flawless compatibility with Apple Lightning devices, ensuring the highest possible charging speeds using an Apple certified charger with your Apple device . Withstand any twist, tug, and tangle with premium braided nylon fiber. The internal components are built to last years, charge after charge. Apple's MFi certification for Lightning cables, ensuring ideal charging speeds for all Apple devices with a Lightning interface. 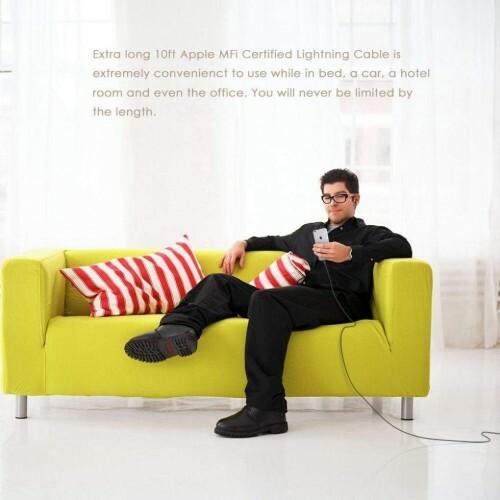 The huge 10ft length MFI braided cable allows you the convenience of being comfortable while charging your Apple device. Make or receive calls, messaging, and using your Apple device all while your Apple device is being charged. iPhone Xs / iPhone Xr / iPhone 8 / iPhone 7 / iPhone 6 / iPhone 5 / iPad Pro, Air, Air 2 / iPad mini, mini 2, mini 3, mini 4 / iPad (4th generation), iPod nano (7th generation) and iPod Touch (5th generation). Any Apple device that has a Lightning interface/connector. It’s compatible with the latest iOS 9. Apple MFi (Made for iPhone, iPad, and iPod) certification ensures complete charge and sync compatibility with your Apple device. Simply connect the Lightning adapter to your Apple device and the USB end to a certified Apple wall adapter or USB hub to charge, or to a computer to sync data. Ideal for home, workplace, car, or nightstand, the charging-and-syncing cable provides everyday convenience and versatility. 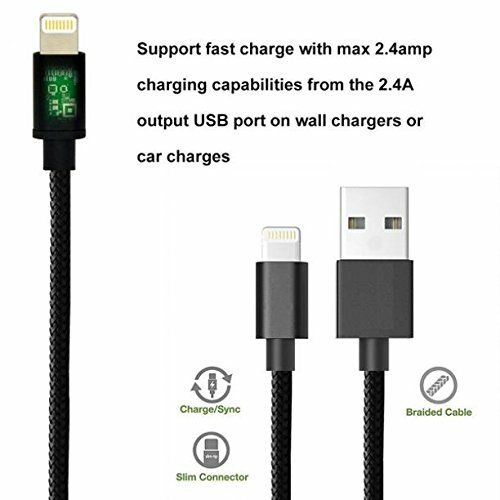 Note: Power output should not be above 5V, 2.4A when charging your Apple device with this MFi braided lightning cable.